MAEVE HIGGINS, one of the best and most popular comedians on the Irish circuit will play two shows at next month’s Galway Comedy Festival. 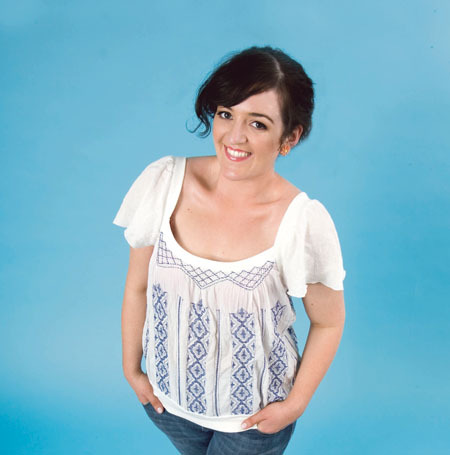 Corkonian Maeve first came to national attention in 2005 for her sketches on the RTÉ comedy show Naked Camera. This was followed by appearances at the Edinburgh Fringe Festival in 2006 and 2007. Since then Maeve has performed at the Melbourne International Comedy Festival, the New Zealand International Comedy Festival, and the Brisbane Comedy Festival. She has written and performed her own TV show Maeve Higgins’ Fancy Vittles and has a regular slot on Ray D’Arcy’s Today FM show, providing humorous advice to listeners’ questions. The Irish Independent called her comedy “risqué and highly intelligent”, while The Sunday Times praised her “edgy charm and heavenly banter”. Maeve Higgins will play the Laughter Lounge in the Róisín Dubh on Wednesday October 20 at 8.30pm. Also on the bill are Phil Nichol and Jarlath Regan. Maeve will also play Cuba*, Eyre Square, on Saturday 23 alongside Pappy’s Fun Club and Gerry Mallon. For tickets contact Zhivago, Shop Street (091 - 569777 ), or see www.galwaycomedyfestival.com A limited number of tickets will also be available on the door of each venue.